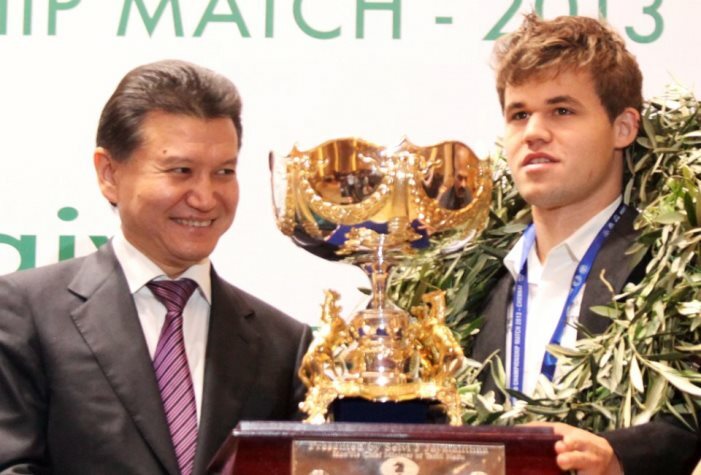 Magnus Carlsen won’t have long to bask in the glory of his World Championship title before he faces a new challenge. The World Chess Federation today announced the next match in 2014 will run from the 6th to the 25th November. The deadline for cities bidding to host the event is the 10th March, with the successful bid to be announced 3 days later. Chess fans have been spoiled in recent years. When Garry Kasparov defeated Viswanathan Anand to retain his World Championship title in New York in 1995 he held onto the title for 5 years before playing another match. When he lost in 2000 his opponent Vladimir Kramnik didn’t play another match until beating Peter Leko in 2004. Then things sped up. Biannual matches were held in 2006 (Kramnik beats Topalov), 2008 (Anand beats Kramnik), 2010 (Anand beats Topalov) and 2012 (Anand beats Gelfand). That pattern broke in November 2013 when Anand held the title only a year and a half before facing Carlsen, and now – if all goes to plan – Carlsen will play his next match less than a year after he was thrown into a hotel swimming pool in Chennai. The very existence of a bidding process is a welcome relief after the 2013 match was awarded to Chennai, India on the basis of a deal done when Chennai lost out to Moscow in 2012. Magnus Carlsen’s team and the Norwegian Chess Federation protested that decision, especially when a bid emerged from Paris offering more money. Paris – a renewed bid must be a possibility. The previous proposal mentioned that the World Chess Federation (FIDE) was founded in 1924 and a 2013 match would be “a prelude to FIDE’s 90th anniversary”. Now, of course, it would actually be the 90th anniversary! Oslo – the phenomenal interest Carlsen has generated in his native Norway increases the chances of a local bid, but would Magnus be accused of hypocrisy after criticising the last match taking place on one player’s home turf? And would he want the extra pressure of playing at home? Baku – the oil-rich capital of Azerbaijan would surely bid for the match if Shakhriyar Mamedyarov won the Candidates Tournament in March 2014 (as might, for instance, Moscow or another Russian city if one of the four Russian players won the 8-player tournament). However, FIDE’s bidding schedule means the venue for the match should be announced at the start of the Candidates Tournament, before the challenger is known. New York – persistent rumours suggest the US metropolis is the early favourite to host its first World Championship match since Anand and Kasparov met at the top of the World Trade Centre back in 1995. That would be a nightmare scenario for Russian chess fans, who would face games starting at midnight. 1. Following the success of last year's World Championship match in Chennai, FIDE and its commercial partner AGON are searching potential venues for the 2014 FIDE World Championship match, where the world champion Magnus Carlsen will defend his title against a challenger to be determined from the Candidates Tournament in Khanty-Mansiysk this March. 2. The World Championship Match 2014 shall take place from 6 November (game 1) to 25 November 2014 (possible tiebreaks/closing ceremony). a) Proposed venue of the event. b) Proposed prize fund for the players (should be offered net of any applicable local taxes). The prize fund for the 2013 event in Chennai was 1,850,000 euros. c) The contribution to FIDE (net of any applicable local taxes and not less than 20% of the prize fund), as stipulated in article 13.2, as well as the financial obligations stated in article 14 of the World Championship Match 2014 regulations. d) Commitment to cover all the other financial obligations to FIDE, in accordance with the regulations of the World Championship Match 2014.
e) Commitment to cover all organizational costs, in accordance with the regulations of the World Championship Match 2014.
f) Category of official hotel (minimum 4 stars), and name if possible, with special room rates for visitors, including meals. g) A statement that the applicant accepts the regulations of the match without any reservations. h) An invitation for 2 (two) members of the FIDE Commission for World Chess Championships and Olympiads to inspect the proposed venue and examine the other conditions, with all travel/hotel expenses paid by the bidder. i) The applicant's name, signatures and authentication. 4. In order for a proposed bid to be considered, it should be accompanied by a 9-month term bank guarantee covering the amount of prize fund (in Chennai 2013 this was 1,850,000 euros), the FIDE contribution (20% over and above the prize fund), 5% for WCOC budget and 5% for the commercial rights plus 32,500 euros covering stipends of Principals as described in article 14.5 of the match regulations. This guarantee should be from a bank that FIDE bankers, UBS of Switzerland, are able to confirm as acceptable. 5. Alternatively to the above paragraph, a bidder can deposit in FIDE's bank account the amount of 200,000 euros by the deadline of 10 March 2014 (refundable if the bid is rejected), another 50% of the prize fund before 31 May 2014 and the balance of all remaining obligations before 31 August 2014. 6. A bid is considered valid if it is accompanied with a non-refundable Bid Fee of 2,000 euros payable to FIDE. 7. No bidder can propose a sponsor which shall be in conflict with the regulations of the International Olympic Committee (IOC). 8. The bids, including all original documents and particulars, should arrive by registered post to the FIDE Secretariat, post address: 9 Syggrou Ave., 11743 Athens -Greece. The bidding process will close on 10 March 2014, 13:00 GMT. 9. When the deadline has expired, the FIDE President or his representative shall open the received envelopes in order to assess the bids. FIDE will inform the bidding parties of the results within 3 days after the deadline. The final contract with the successful bidder shall be signed within 10 days afterwards. 10. FIDE reserves the right to accept a bid based on the evaluation of all criteria under article 3 of the present bidding procedure and not only that of the prize fund. FIDE also reserves the right not to award any bid at all, however favorable it might be.